This is our fourth consecutive year that we are offering an international concert Cycle focused on early keyboard instruments such as the harpsichord, the spinet, the virginal, the muselaar, the fortepiano, and the historic organ. 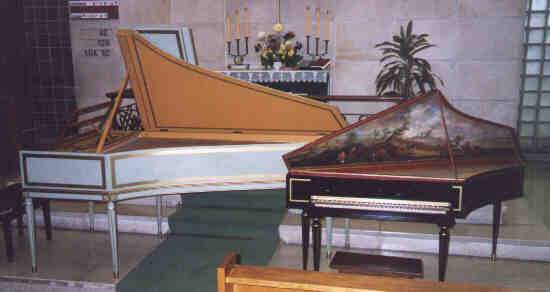 For the 2005 Cycle, 9 harpsichord concerts have been programed from April to November, that will take place admission free at the "Congregación La Cruz de Cristo" Lutheran church, Amenábar street 1767 (between José Hernández and La Pampa streets), Belgrano quarter, Buenos Aires, Argentina, and 4 organ concerts at the Congregación Evangélica Alemana de Martínez, Santa Rosa street 450 (near La Lucila station. See below our 2005 program. This Cycle is part of the LUTHERARTE project, of the Lutheran Congregation "LA CRUZ DE CRISTO", developed by the Rev. César Bernardo Gogorza, Kathy von Hefty and members of the Congregation, thus opening the Church to arts and culture. Recently awarded by Asociación de Críticos Musicales de Argentina. Our hearty thanks to Fundación Banco Galicia for their essential contribution for this Cycle development, to Mr. Ricardo Grätzer and to Collegium Musicum for their support and the printing of the hand programs, to Mrs. Inke Frosch and to Congregación Evangélica Alemana en Buenos Aires (Martínez) for their institutional support, to Mrs. Zsuzsó Haynal for helping us checking and translating, to Mr. Alejandro Rojas Lagarde, Dr. Pedro Tesone and Mr. Werner Bognar, for their important colaboration in the organitation and Cycle concretion, to Lic. Blanca Sersen, to Mr. Rafael Ferreyra, to Lic. Sylvia Leidemann, and to all the musicians that offer their soul and art in this production. Saturday 26th - 10:30 to 12:30 a.m. & 1:30 to 3:30 hs.p.m. Saturday 23th - 7 p.m.
Tuesday 17th. - 8 p.m.
Saturday 21th. - 7 p.m.
L. Couperin, J. S. Bach, D. Scarlatti, F. Geminiani, L. Mucillo, Ary Barroso and Pixinguinha. Sunday 29th. - 7 p.m.
Saturday 18th. - 7. p.m.
Saturday 16th. - 10 a.m to 1 p.m.
Saturday 23th. - 7 p.m.
Sunday 31th. - 7 p.m.
Saturday 20th. - 7 p.m.
Saturday 17th. - 7 p.m.
L. Couperin, F. Couperin, J.H. dAnglebert and J. Duphly. Sunday 25th - 7 p.m.
Saturday 22th. - 7 p.m.
Saturday 19th. - 7 p.m.
Sunday 27th - 7 p.m.
Jan P. Sweelinck, S. Scheidt, van Noordt, J. Pachelbel, D. Buxtehude, J. G. Albrechtsberger and J. S. Bach. Amenábar street 1767 (between José Hernández and La Pampa streets, Belgrano, near José Hernández station from Subte D). Santa Rosa street 450 (first paralel to Paraná street, near La Lucila railway station, Ferrocarril Mitre).